Today I'm sharing a rather healthy dish to use some of that leftover turkey. I made this awhile ago, but used leftover chicken. It has a nice crunch to it and it's rather light, and would be wonderful to serve the next day after the big Thanksgiving dinner. I love this Blessings mug that I received from Vee. She sent this mug to me before the actual mug that she ordered, arrived. It was from Stephanie's teacup and mug exchange from two years ago. I love both of the mugs that Vee sent! 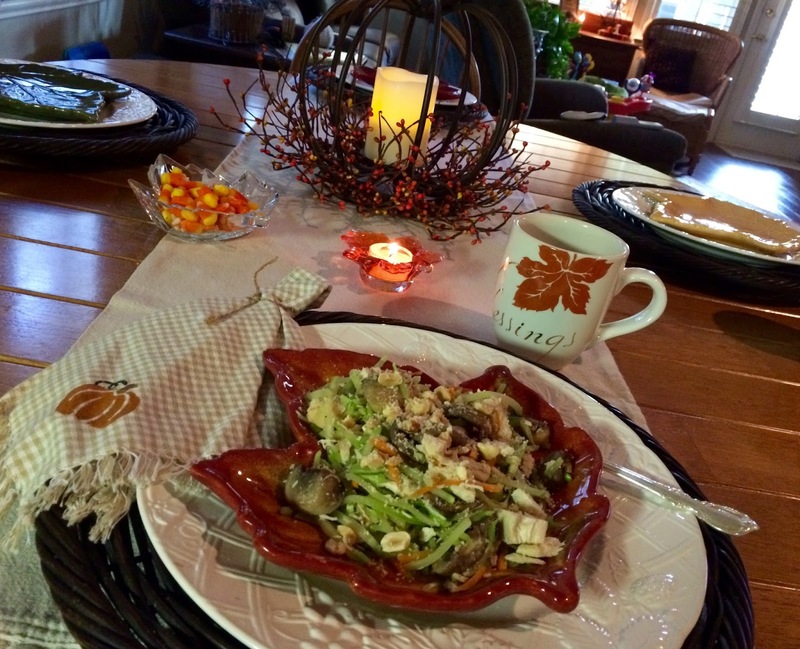 Here's this healthy dish, which comes from Autumn, Susan Branch, From the Heart Of The Home. Combine first 3 ingredients in a large skillet over medium high heat. Add mushrooms and cook until soft. Stir in garlic and cook 1 minute more. Add broccoli slaw, cook and stir until slightly wilted. Stir in cooked turkey and salt and pepper to taste. Heat through just enough and not overcooking broccoli. Divide onto plates and sprinkle with Parmesan cheese. Happy Thanksgiving to all! I'm spending the week cooking for my dear Mom in Ohio, and may not have time to visit with all of you. I like that cup also it has such a pretty leaf and saying. Vee is a very special person! That looks like a delicious way to use up leftover turkey or chicken. Enjoy your days with your mom. Happy Thanksgiving to you, Kitty. Thanks, Kitty! 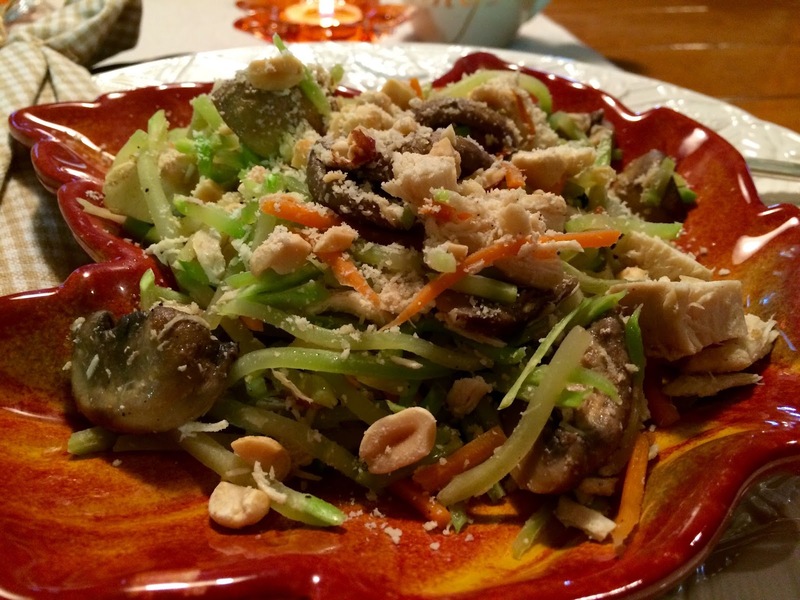 We all need healthy ideas and recipes for leftovers! Much appreciated- looks so delicious! Mmm, this sounds delicious, Kitty. You share the best recipes! I love turkey and chicken leftovers for such dishes as this one. Thank you for sharing another wonderful recipe and enjoy your visit with your mom. Happy Thanksgiving to you all! May it be a blessed time of love and family. Good afternoon, sweet friend. This sounds like a delicious meal! Thank you for sharing. I hope you are doing well..... You have been in my thoughts. Love you, Kitty! This sounds delicious and healthy, Kitty. Have a wonderful holiday with your mom! Nice and light. Perfect for a Thanksgiving day-after! Happy Thanksgiving, Kitty! I'm sure your mom will enjoy all your delicious cooking! Did you inherit your culinary skills from her? Hi Kitty, This sounds so good and the perfect after Thanksgiving meal. Thanks for sharing the recipe. Have fun at your mom's and wishing you all a very Happy Thanksgiving. That looks delicious! We all need great recipes to utilize leftovers. What a neat mug too! Thanks for linking to Tuesday Cuppa Tea. What a great dish and so pretty on the left plates. I think Susan would be proud of you. You should post a note with a link on her blog! So glad you shared! I love the mug too! I'm often looking for different coffee mugs and have some that I call "seasonal". :) This dish looks and sounds delish! I will definitely be trying it. So glad you're able to be with your mom! May you have a blessed and very Happy Thanksgiving. What an unusual & interesting twist on leftovers, Kitty! I have leftover turkey already & just need to go purchase the broccoli slaw to be able to try this. Thanks!! Sending ~~safe traveling mercies~~as you fly closer to me. Give your sweet Mom a hug from me, please? You are very fortunate to still have her to celebrate with!!! Hello Kitty, your gifted blessings mug is lovely! And your new recipe sounds intriguing with those ingredients. We always need new ways to serve leftover turkey! lol! I'm going to bookmark this Kitty; it looks very tasty. I have a deathly allergy to sesame though, so will have to sub for that. Your table looks so warm and cozy; gifts from friends always make it more so. This sounds so tasty! How interesting! Your salad looks delicious. I love all the healthy ingredients too. I will experiment with the left overs from Thanksgiving. Wishing you and your family a blessed Thanksgiving. Kitty, thank you for your leftover turkey/chicken recipe. It looks delicious and healthy too! Hapy Thanksgiving! 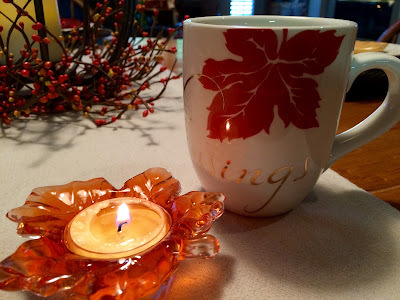 Your Turkey in the Straw recipe looks fabulous and your Blessings mug is lovely. This is such a great alternative to turkey soup and sandwiches. I'm so tired of those leftover meals. Usually I'm craving something fresh and with vegetables and this recipe is perfect. Happy Thanksgiving Kitty! I feel like I shouldn't eat anything for the next 3 days after today's feast, but maybe I can get away with this healthy take on leftovers, thank you! Turkey-in-the-straw-do-do-do-do-do is what's playing in my head now and most likely will be all day! LOL! This looks very good! Pinned! Found you on Foodie Friday blog hop! Yum, Kitty, that does look so good. Love your blessings cup too. I am back blogging. Hope you'll drop by! Sounds yummy Kitty! I made a casserole with our leftover turkey and we ate it today after church. Thanks for sharing with SYC. Yummy recipe for this time of year. We went out for Thanksgiving, so we didn't have any leftovers...boohoo.